Nationwide, the total amount of state financial aid from grants provided to undergraduates at public and private institutions nearly doubled between 2001 and 2011, from $4.6 billion to $9.1 billion. On a per-student basis, state funding for student grants increased from $613 per undergraduate in 2001 to $858 per undergraduate in 2011 (in current dollars). 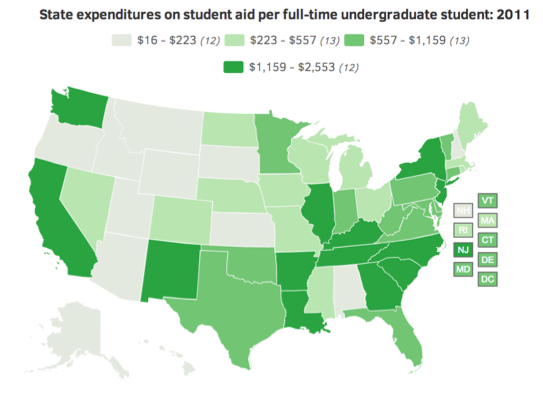 The amount of financial aid provided to undergraduate students varies considerably by state. In 2011, state aid per student ranged from $16 in Wyoming to $2,553 in South Carolina. Seven states averaged less than $100 per undergraduate student, while 14 provided more than $1,000 per student. Eleven states spent less per student for student financial aid in 2011 than in 2001 (in current dollars), even though the cost of undergraduate education rose rapidly during this period.